There is scattered news of Stokowski releases. Neither RCA nor Pearl have any scheduled plans for releases in 1996, but we can hope. There are three new discs I want to review with you and news of four releases to come in 1996. Let's start with EMI's latest FDS series, The Orchestra and Landmarks of a Distinguished Career on CDM 65614 2. The cover of the disc has the two titles in the reverse order from the above, but the contents are in the order listed in this article. You may know that Stokowski recorded The Orchestra as a kind of introduction to various aspects of classical music. Each selection was supposed to represent some aspect of the orchestra (ex. percussion, strings, etc.) in an attempt to educate people. There are some rare items on this disc: Harold Farberman's Evolution (Part I), Vincent Persichetti's March from Divertimento for Band, and the only commercial recording of Stokowski performing the Ravel transcription of Pictures at an Exhibition (Hut on Fowl's Legs and The Great Gate of Kiev). There are other interesting items in this disc, but I do wish that EMI had included all of the second LP (Landmarks) instead of only five pieces and omitted some of those from The Orchestra. I had really been hoping to have Turina's La Oracion, but no. Unfortunately, my expectations and hopes have been further dashed by the transfers. The sound here is thin and lacking bass. What is really tragic about this is that it didn't have to happen. I first had fears when I listened to Barber's Adagio on this new disc. I went to our collection and got out the earlier CD release with this in it (7777-47521-2 with Bartók's Music for Strings, Percussion and Celesta and Schoenberg's Transfigured Night). That earlier release is much better. The sound has a fullness, richness and firm bass line, all of which are not on this disc. What happened? I wrote to Ed Johnson about this release. He informs me that the problem is that EMI went back to the original tapes, not the tapes which were adjusted and approved by Stokowski. As Oliver Daniel pointed out in his tome Stokowski: A Counterpoint of View Stokowski was always "meticulous in his attention to detail" (p. 680) and EMI should have gone to the tapes Stokowski approved. What we have here is not the Stokowski Sound!! I hope we can manage to see that this problem is taken care of when EMI issues its next batch of Stokowski recordings (I was told it would be in the Spring of '96). This is not the first time this problem has crept up. I mentioned a similar debacle in another article reviewing all of EMI's latest releases when EMI issued its FDS recording of Holst's Planets, recorded with the L.A. Philharmonic. That same problem plagued the sound on that disc, but an earlier release (on their Seraphim series) is much better (look for that one). While I know that the latest technology allows producers to literally change the sound from the original release, and while Robert La Porta has good intentions, the discs should reflect what Stokowski wanted. The next CD is of some interest, but there are certain reservations. 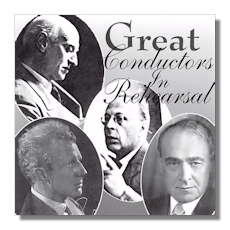 It is a two-disc set titled "Great Conductors in Rehearsal". Disc one has Serge Koussevitzky rehearsing Liszt's Faust Symphony with his Boston Symphony Orchestra. The is Victor de Sabata rehearsing four pieces with, I assume, the same orchestra, but the notes are not completely clear on this matter. Disc two has Leopold Stokowski rehearsing the San Francisco Symphony in excerpts from Boris Godunov, in Rimsky-Korsakov's version. N. Rossi-Lemeni is the soloist. This is followed by the Russian Easter Overture (sans bass) and then movements 2-4 of Brahms' Second Symphony. There is no mention of dates, but a quick check in Oliver Daniel's book confirms that these rehearsals took place when Stokowski was guest conducting in 1952. The disc is completed with two rehearsal's with George Szell conducting the same orchestra. The disc is available only directly from Michael Thomas c/o Archive Documents 5A Norfolk Place London, W.2 1QN England. (Phone number is 0171 723-4935). I did not sample the non-Stokowski items and so cannot verify if the same problems affect the other rehearsals. First, the good news. Stokowski can be easily heard and there are some fascinating moments. I have always found it interesting to compare Stokowski's rehearsals with those of others. I mentioned in another article that listening to Bruno Walter was irritatingly insightful. Walter would suddenly halt the orchestra when there seemed to be no reason. He would then sing what he wanted and have the orchestra replay the music. He would do this until they'd get what he wanted. Then you could hear why he stopped them. Stokowski does not stop the orchestra as often. When he does it is to give instructions ("fade, fade…don't cut.") and then move on. He also shouts instructions as they play ("No! No! Piano, piano!) and effects the change. At one point in the Brahms rehearsal he stops the orchestra and says, "I want to go down there, cellos, and listen to see if it sounds the way it really should" (you hear his walking) "because you're a little back there." Then he has the orchestra repeat the passage. Stokowski pinpoints parts he apparently feels are most important and has the orchestra jump from point to point. Often Stokowski just has the orchestra play and seemingly effects changes with his looks and movements. The main drawback, and it will be more or less major based on your own feelings about the matter, is that the CD was made directly from acetate discs and there is a lot of wow and flutter. It makes it difficult to really hear him achieve the Stokowski Sound. Despite my qualifiers, you may want to add this interesting disc to your collection. Finally, Music & Arts has just released Stokowski's 1963 London Symphony Mahler 2nd. Rae Woodland is the soprano, Janet Baker, mezzo soprano. (M&A 885). I praised highly an Intaglio (where have they gone? the same place as Arkadia?) compact disc of this performance. This release is offered in even better sound!! Most likely some reverb has been added to the tape, but there is almost a stereophonic quality to the sound. The bass is more firm and the whole thing more agreeable. In fact, here is a summary of the critical review I gave this disc. I sat down and listened to Music & Arts disc. As usual for me, I was using the Beyerdynamic headphones. After getting a sense of the sound through listening to most of the first movement and then spot checking other movements, I turned to the Intaglio disc. A few moments of listening to the first movement convinced me that there was a significant difference in the sound. I put the Music and Arts disc back on and began listening. Yep! This sounded better. I took a pen to make notes. The next thing I knew, the symphony was over. I looked down at my notes. All I had written was: "Stokowski's is not a Jewish Mahler- – listen to the oboe- – but it is Mahler. Approximately 6:30 into the Third Movement the sound breaks up for a moment." That's it. It was one of those evenings where, after having had that kind of listening experience, I didn't want to hear anything else that night. I think that one of the things to remember when you happen to specialize in something like a particular conductor's work, is that no matter how much you personally happen to like that artist's interpretations, the conductor is not infallible. I have heard three different Stokowski Mahler Resurrection Symphonies. I have heard different transfers of this particular one. The bottom line has to be that the conductor has tapped some essence of the music. If his interpretation is just a subjective one, then it is not a valid one. 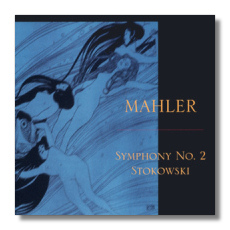 Stokowski seems to tap the essence of the Mahler 2nd better than in the other two recordings with which I am familiar. In case the point has been lost: GET THIS DISC. Already advertised in Gramophone is a Philips two-disc set from their Early Years series. The set (442 735-2) may not be released in the U.S. I got this information from the Public Relations Manager of Philips in this country. She gave me the FAX of the European Public Relations Manager. I have written him requesting a review copy and that they consider making this available in this country. I have not received a reply as yet, but will keep you posted. I am anxious to hear it, for these discs contain some of my favorite Stokowski/Tchaikovsky recordings. The discs contain: Capriccio Italien, Francesca da Rimini, Serenade for Strings (this was released on a previous two-disc set from Philips "The Best of Tchaikovsky") the Polonaise and Waltz from Eugene Onegin and the Nutcracker Suite. I have just talked to a member, Jerome Selmer, who came across this in his local Tower Records. It was a "special import". I haev not heard from Philips as yet, but will send you a review as soon as the discs arrive from Jerome. While there is no indication of an exact release date, Ed Johnson sent me a memo from Decca regarding the first releases in the Phase-4 series. The top of the memo indicated a January release, but Ed's notes tell me that it will be in the Spring of 1996. 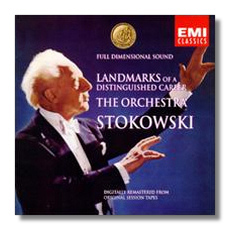 There are three Stokowski discs in the series and all are strongly recommended. Compact disc 443896-2 contains the 1812 Overture, and Marche Slav, Mussorgsky's Night on Bald Mountain and Boris Godunov: Symphonic Synthesis, and Borodin's Polovtsian Dances. The next disc is also all Russian, in a sense, containing the Mussorgsky/Stokowski Pictures at an Exhibition, Scriabin's Poem of Ecstasy, and Stravinsky's Pastorale and Firebird Suite. If you can afford only one disc, make it this one. Stokowski's Pictures is much more Russian than Ravel's and this recording of the Firebird is my personal favorite. The last disc is an all-Wagner CD (443901-2). It contains the same material previously released on the Weekend Classics series, but I hope the remastering is better this time around. There is a Meistersinger Overture from the 60th Anniversary Concert Stokowski conducted with the LSO. The remaining items are from the Ring: Ride of the Valkyries. Forest Murmurs, Entry of The Gods into Valhalla, Dawn & Siegfried's Rhine Journey, and Siegfried's Funeral March. If you have not heard these as yet, you are in for a treat. I remember getting the LP of the Ring material and being 'blown away' by the Valkyries and the Meistersinger has a Stokowski effect, realized by the Maestro's sense of relief more so than any touchings, where the strings seems almost to be passing the music around. I was reading an article in the January Gramophone about Debussy's Images and it piqued my interest in the piece. So, I pulled out the recordings in my personal collection, which includes Pierre Monteux with the London Symphony on Philips, and Bernard Haitink, in a two-fer set on Philips which contains some of the finest recordings of Debussy you'll ever hear, and Ibéria al la Stokowski. I'd recommend the article in Gramophone, especially the discussion of the different movements. Anyway, Jonathan Swain, the author, recommends three recordings of the entire piece and also discusses recordings of just Ibéria. I listened to all of those mentioned and, frankly, the Stokowski is the most sensual of them all. In fact, both Monteux and Haitink pale by comparison. The thing that kept coming to my mind, however, was that this particular recording is one of the finest examples of Stokowski of them all. Both the sound and interpretation are classic Stokowski. The other items on this disc (EMI 2435-65422-2) are Debussy's Trois Nocturnes, Ravel's Rapsodie Espagñole, and Ibert's Escales. If you do not already own this disc, get it!! It represents the best of Stokowski in every sense of the phrase.